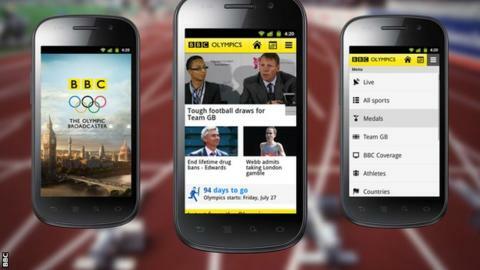 The BBC has launched a London 2012 Olympics app for Android and iOS smartphones. The app will provide up to 24 streams of live coverage, detailed schedule and results pages, and daily news stories. Alongside full live streaming, catch-up coverage and highlights, the app will offer facts, statistics and information for every athlete, country and sport. Phil Fearnley, General Manager BBC News & Knowledge, said: "We needed to ensure everyone could access our coverage." The user will also be able to access live daily text commentaries, news stories and a detailed schedule and results section covering every Olympics event. Extra functionality of the app allows stories to be saved for offline reading, ensuring the latest information is accessible even when mobile reception is unavailable. Fearnley added: "The BBC Sport Olympics app ensures that everything you need to keep up-to-date with the action is right there at your fingertips. Even when you're out of range of 3G or wireless, we'll still be able to deliver the latest news to you offline. "The app adds even greater value to the BBC Sport mobile experience, ensuring you never miss a moment of the Games."